Often with his colleague Brian Edwards, Dunn makes “microetchings” which depict the brain and its neural processes. He begins by making a traditional ink drawing, which he then scans into a computer. Dunn then prints the etching data onto a transparency and laminates the material onto a sheet of steel. While studying neuroscience in graduate school, Dunn began to experiment with science-inspired art. When he spent his days in the lab, he realized that he was surrounded by stunning imagery every single day—it was all under the microscope. He began to simulate what he would see on the page, in the style of Japanese and Chinese ink drawings. 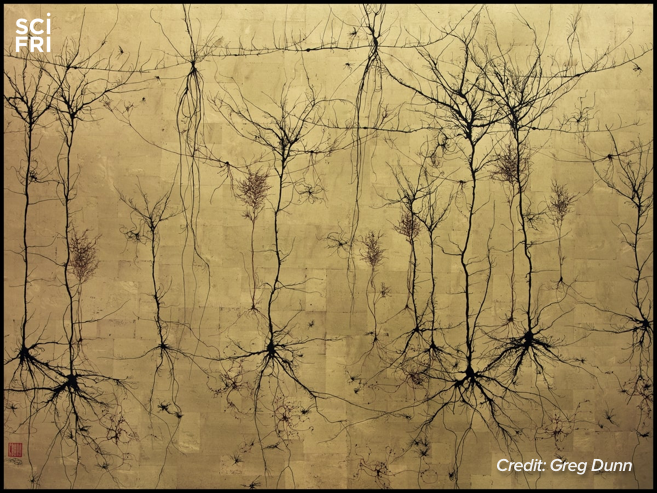 Dunn wanted to draw parallels between the classic subjects of eastern Asian art, and the expansive world of neurons. “The only difference between a landscape of a forest and a landscape of a brain is that you need a microscope to see one but not the other,” says Dunn. By couching his depictions of neurons and the brain in an aesthetic style that many people recognize, people could make those connections themselves, he says. A 16th century Japanese sumi-e painting by the Japanese artist Sōami. To depict a neuron firing, Dunn uses gold leaf and manipulates the reflectivity of the metallic surfaces. He and Edwards also dabbled in etching and lithography, and used the technique to create millions of microscopic details in the surface of a microetching, all of which reflect the light in highly specific ways. “Our minds and our brains are the fundament of who we are as human beings,” Dunn says. “It’s a concrete processing device which allows us to go about our daily lives. And I think it’s important that people understand that, and recognize the preciousness of their own brains. See some of Dunn’s work below, and check out his website.